This entry was posted in Making, Creating + Frugal Living and tagged chickpeas, cooking, easy, Frugal Living, morroccan, quick, simple, vegetarian by cityhippyfarmgirl. Bookmark the permalink. This is looking and sounding superb Brydie. When you can assemble something as hearty and delicious as this in the short amount of time, it makes those curries-in-a-bottle seem even more ridiculous. Love the addition of the carrots – and appetising presentation as always. Dead quick and easy, and with out all the added extras that a ‘jar’ of something would have in there. Ohh, now that’s exciting. I haven’t been to Eveleigh for awhile, so will have to keep my eye out. now this is what i call real and perfect food..no dry ice mist or taste bud trickery here thank goodness..
Nah, definitely not Jane. One pot wonder that’s done super quickly, cheap and healthy. Lovely, thanks Brydie. I have some pumpkin lying around looking a little languid and might also bung in some chopped preserved lemon. Ooh, and perhaps some currants – sorry, can’t help tweaking! Yes please, open a can for me, though I have to confess that after reading about this boiling and freezing your chickies the other day that’s just what I did yesterday. Trouble is I forget I’ve done it, so still reach for the cans on auto pilot. Can I ask what is English spinach? Never heard it called that here. What are the other sorts? I did wonder whether to type it as such. Sometimes silverbeet can be called spinach here. This does look good- and it is so quick! I just cooked up some dried chickpeas that I was planning on using in a summer salad with avocados and tomatoes. I made a big batch- maybe I’ll make the curry as well! One for lunch and the other for dinner! Such a bad idea to read this at lunchtime, my yoghurt and muesli are really unnattractive now!! Hey nothing wrong yoghurt and muesli, I’m a big fan…. for any meal of the day! 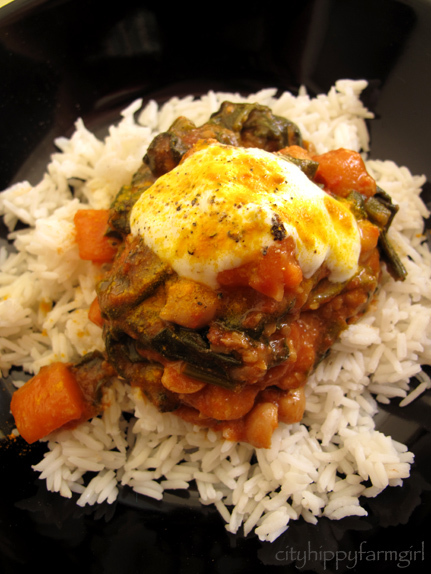 Oh, I’ve just added that to my meal planning for the week – it will use up spinach (which we have a surplus of in the garden) and another tin of chickpeas. Thanks for sharing. Excellent! Hope you like it. This looks delicious! And I’m always keen on new ways to try chickpeas (especially those that aren’t fiddly). As soon as I’m back home, I’ll be scheduling this in. Chickpeas are great aren’t they. An easy, tasty protein. Tandy can you get it locally grown when it is in season? What a hearty, comforting flavourful meal. I love quick and easy meals. think we are going to need frugal monday, tuesday and wednesdays too at the moment. Really feeling the pinch! I think this would be declicious especially with that dollop of yoghurt on top. Yogurt is great on so many things isn’t. I still make your eggplant curry from many frugal Fridays ago :)Just waiting for them to come in season! Yum! I’m a bit of of a fan of the chickpea – a perfect ingredient for your frugal Friday dinner. Looking forward to when garlic is back in abundance. Sounds fabulous and as I have a massive amount of beetroot tops and swiss chard that needs using up I might just make this tonight. The thought of fresh chickpeas had never crossed my mind until now – how silly, I guess you can get them in Oz? I made it this evening and it was delicious. I also cracked open a jar of preserved lemons that I made last year to go with Moroccan style green beans – yum yum. Sounds like a quick, tasty meal full of colorful goodness. looks delicious! I love all those vibrant colours!